And again two weeks have passed. As it is currently raining and even snowing almost all around the clock, it's not easy to find a suitable gap for a birding walk. Fortunately, Wednesday, the 26th October, was one of these rare good days, when I could spend the full afternoon in the field. Like in the years before I focuse my attention in the end of October on the Sander Baggersee Ost, where I've been rewarded more than just once (see here for example). It felt good to breath fresh air again and scan the many common birds for rare guests. 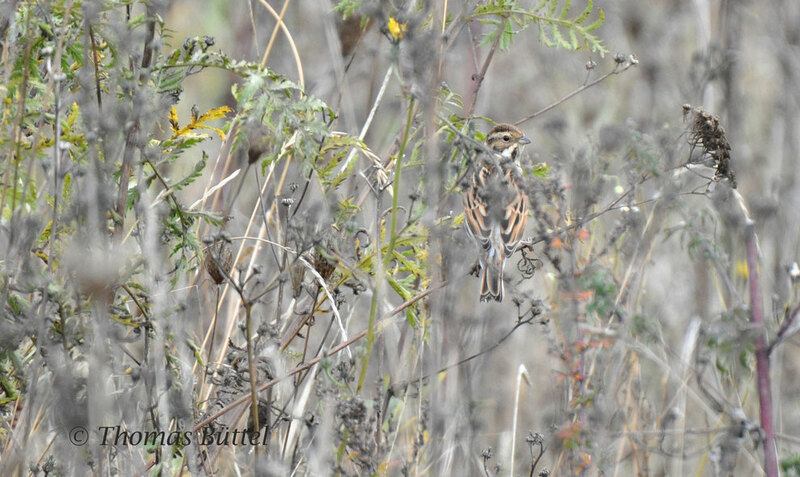 I was happy to find already on the first meters a large mixed flock of Reed Buntings, Yellowhammers, Linnets and Serins which was feeding in the vegetation on the embankment. Really surprising however was a single Stonechat that had obviously joined the latter. 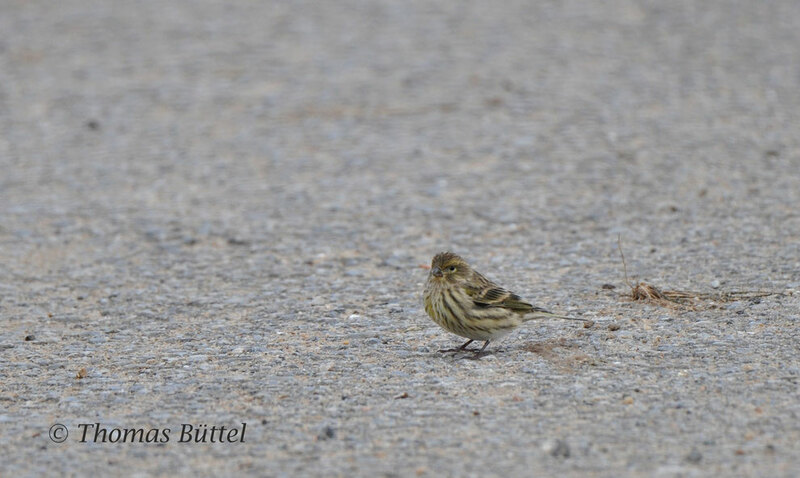 Apart from the known breeding sites this species has become a rare migrant in Franconia and is therefore always a highlight on a birding walk. A quick look on the lake produced one of the larger white-headed gulls (either Yellow-legged or Caspian), some hundred geese and my first Pintails of the autumn. Already pleased with the day I turned around after two fulfilled hours. 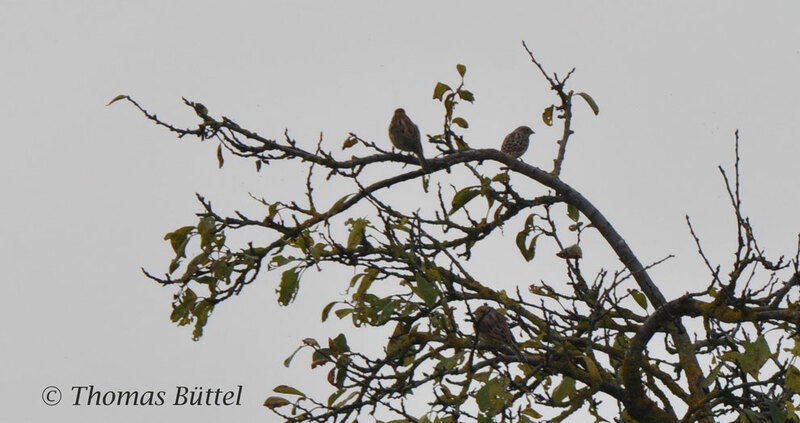 On the way back I eventually spotted a couple of buntings sitting on a distant tree. Fortunately I could convince myself to take a look through my scope instead of walking straight back to the car. Of course the buntings turned out to be the usual Yellowhammers, all but one, which was apparently lacking any trace of yellow in its plumage. Alarmed I took some record shots and tried to get closer to the bird, as it looked so far pretty good for a female Pine Bunting. Sadly, the bird always showed its back towards me and never turned around. However, as soon as I had halved the distance between the bird and me, the buntings dropped down on the field without giving me a chance to find the bird again. Because of the distance and the fact that the bird never showed its underside, I cannot be absolutely sure about the ID as Pine Bunting. So anything that remains is a very poor record shot of an interesting bunting.